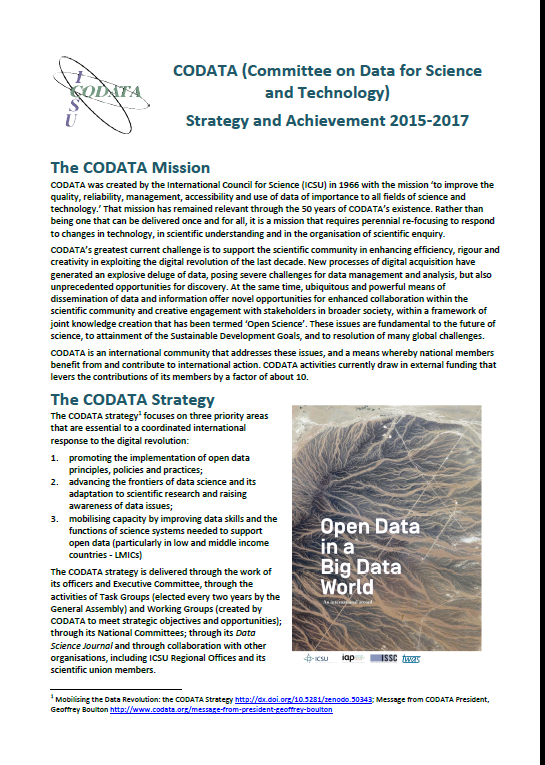 A third and final update of the CODATA Prospectus 2015-2017 has brought the document up to date to the end of 2017 and looks forward at major activities in 2018. CODATA convened workshops in June 2017 (ICSU, Paris) and November 2017 (Royal Society, London) to prepare a Commission on Data Standards to address issues of interoperability and data integration in particular for interdisciplinary research areas. The initiative is now moving forward with three pilot case studies, examining the issues of data availability and interoperability in relation to infectious disease, disaster risk and resilient cities. In 2017, the CODATA-RDA Schools of Research Data Science expanded, adding three advanced workshops to the recurring event in Trieste (July) and running a foundational school in São Paulo (December). In 2018 schools will take place in Brisbane, Australia (June); Trieste, Italy, with advanced workshops (August); Kigali, Rwanda (October) and São Paulo, Brazil (December).